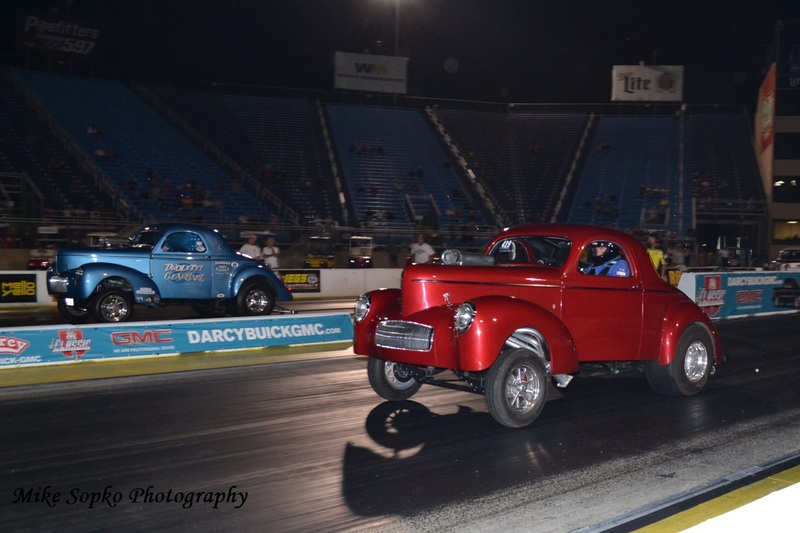 The Route 66 Classic continues to be a staple of Midwest Nostalgia Drag Racing. 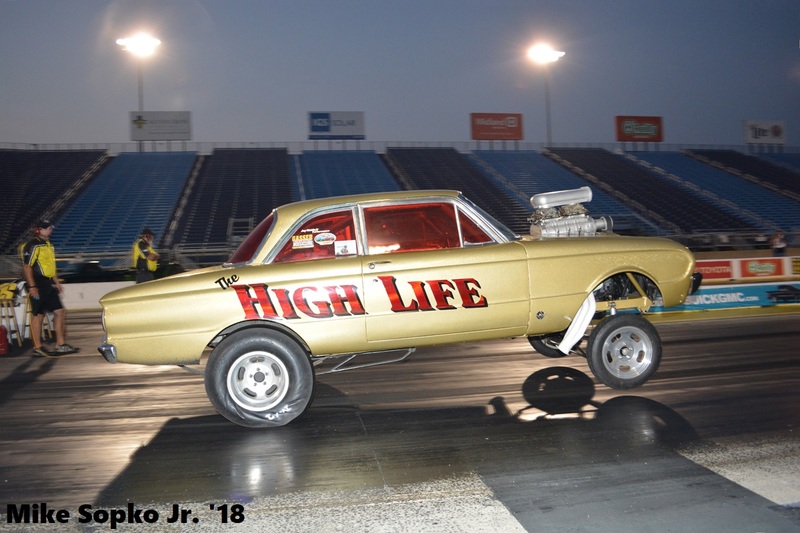 The 2018 edition took place on August 18th featuring throwback music, a cruise in, a Pin-Up girl contest, a Cacklefest, and of course, vintage drag racing. Here were some of the highlights in case you couldn’t be there. Nostalgia Super Stockers and Gassers continued to wow the fans. Not only do these cars carry the vintage appearance straight out of the 60’s but many of them are rolling pieces of art. Furthermore, these drivers know how to put on a show with mosquito-killing burnouts and bumper dragging (especially for those electing to go without wheeliebars) wheelies which continually caused an eruption from the fans. Rich Berlisk in "Asphalt Angel" hits the wheelie bars! Great name for a tall straight axle gasser that is the color of beer! There were a couple new cars on the premises, which is always a good sign for nostalgia drag racing. 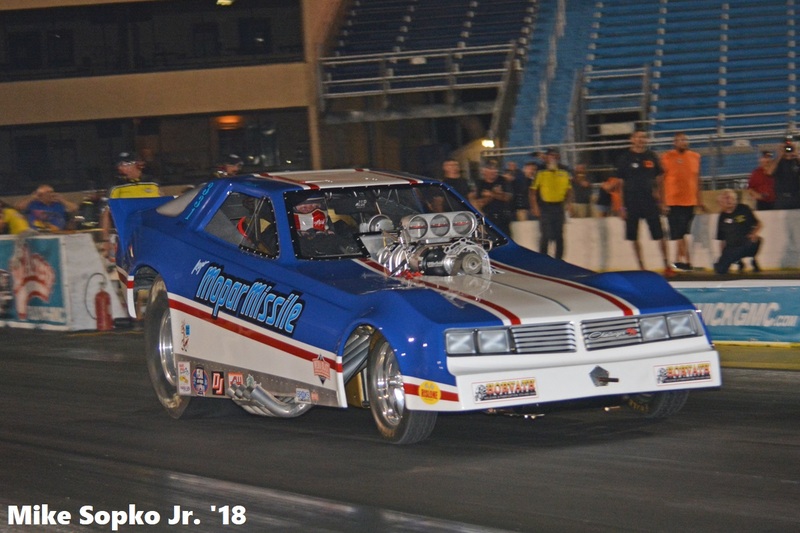 The Nostalgia Alcohol Funny Car of Dana Kleinhoffer was in attendance with a classic late’ 70’s Firebird body, and a name from the past too. The beautiful funny is named “Tremor” which brings back memories of the former Bud Williams’ floppers. 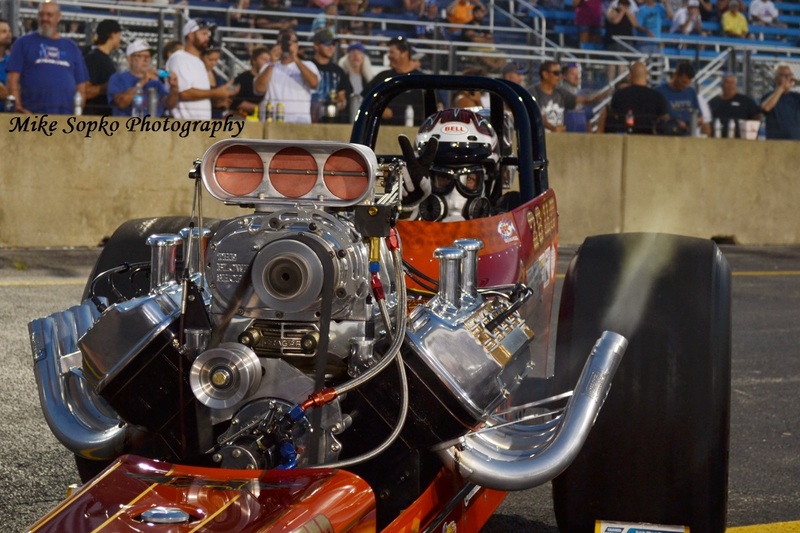 This car ran as good as it looked with a sub 7 second run in the evening at nearly 207 mph. The Classic also featured the debut/return of the “Avenger” Streamliner from Tony Zizzo. I have to admit I’m a sucker for streamliners. I have been since I was a kid and Gary Ormsby, Garlits, and Bernstein showcased their streamliners. I know Bernstein’s “Batmobile” is looked at with consternation as the beginning of the end of funny car bodies, but as a kid it captured the imagination and I was a huge fan. So much so that my nickname from that time on has been “Bud” because of Bernstein’s sponsor (in fact we refer to my son as Bud Light). Zizzo’s streamliner is a work of art and more impressively runs on nitro. Zizzo made a shakedown pass where it was evident they were not opening the throttle all the way. Still even with an early shut off he ran an 8.01. As they continue to make progress on this unique vehicle, look out as it should be something to behold. 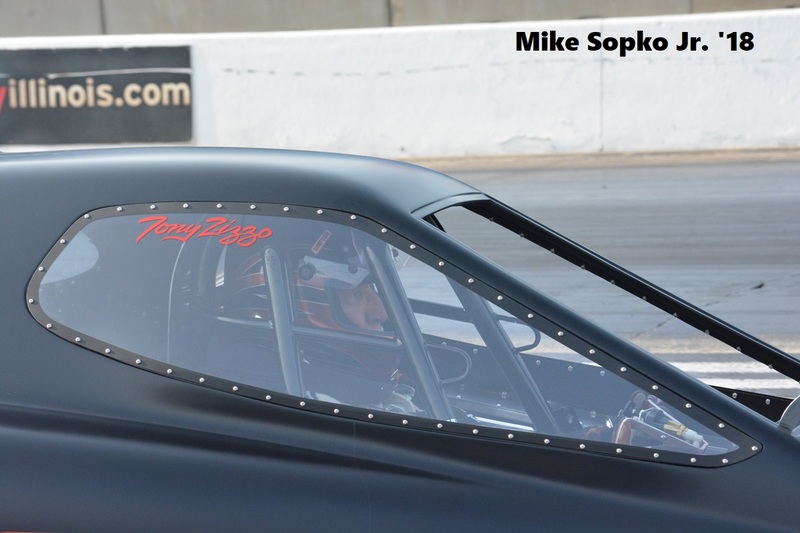 Tony Zizzo prepares for a pass in his "Avenger." 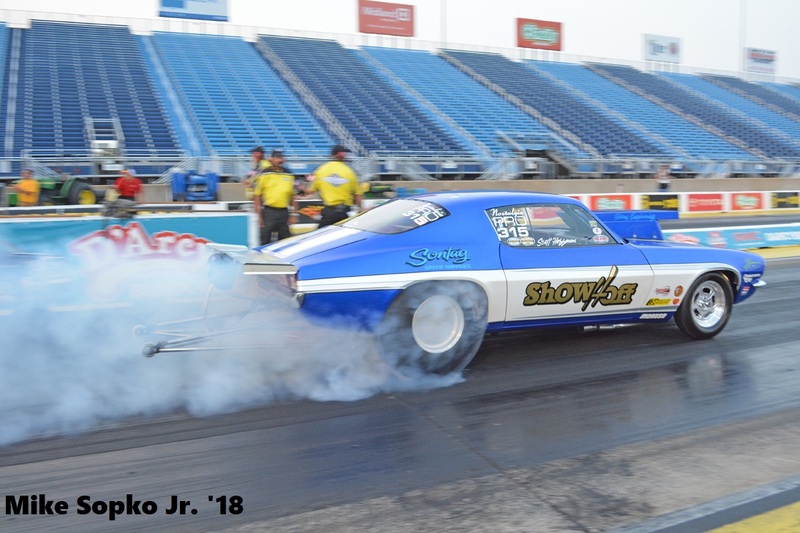 For a long time, it has been the slingshots and funnies grabbing the nostalgia attention, but the Nostalgia Pro Stock scene seems to be flourishing. More and more cars seem to be appearing and different subsets of the class are popping up all around the country. For those fans missing the days of hood scoops, dry launches, and big wheelies these throwbacks from the past are a breath of fresh air. In addition to their antics the performance of these vehicles continues to improve with ETs regularly reaching the low and mid 8’s. Scott Hoffman in perhaps the best looking Nostalgia Pro Stock. New this year to the Classic was a Cacklefest. 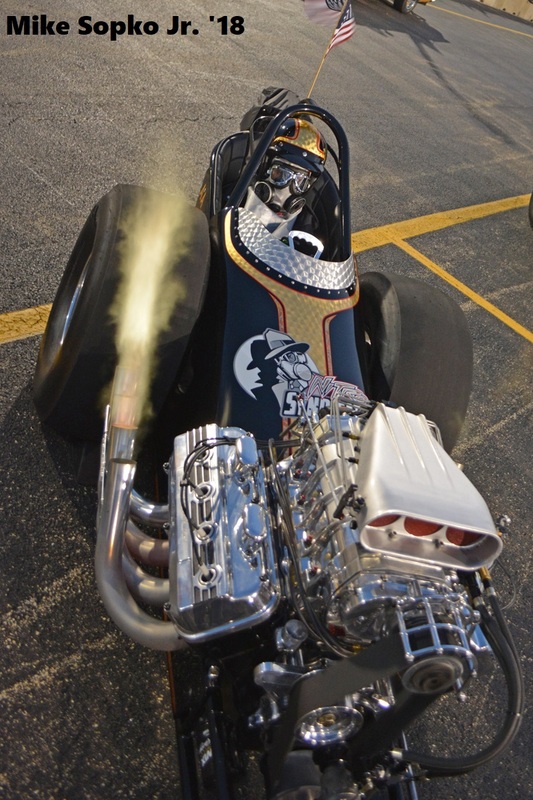 The Cacklefest staged four nitro-burning slingshots on the return road and performed a simultaneous static start. The cackle of these cars echoed throughout the stadium atmosphere of Route 66 Raceway and flames licked at the summer sky. It was a welcome treat to the fans who should their appreciation with raucous applause. 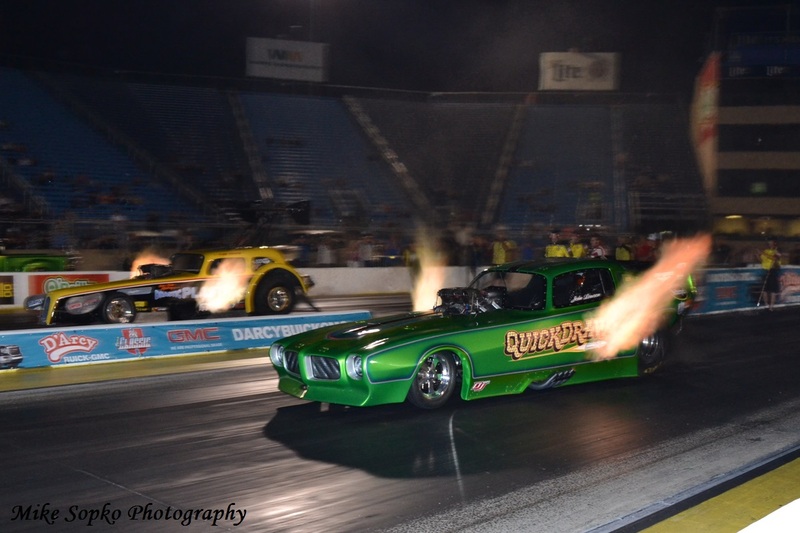 (L) The "Nitro Syndicate" cackle car with flames out of the right bank. 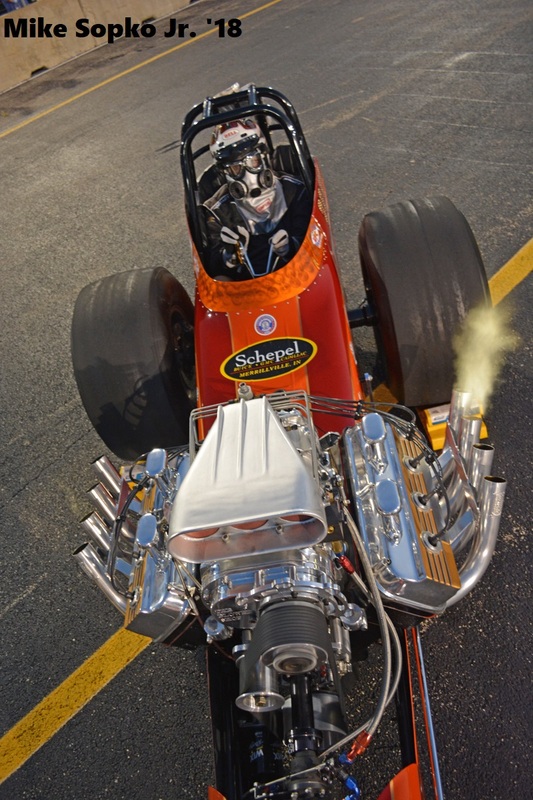 (R) Tom Schepel cackles his "Schepel Speedmaster" front engine dragster while flashing the "V."
Denny Salzwimmer’s Great Lakes Nostalgia Funny Car Circuit returned four cars to entertain the fans. 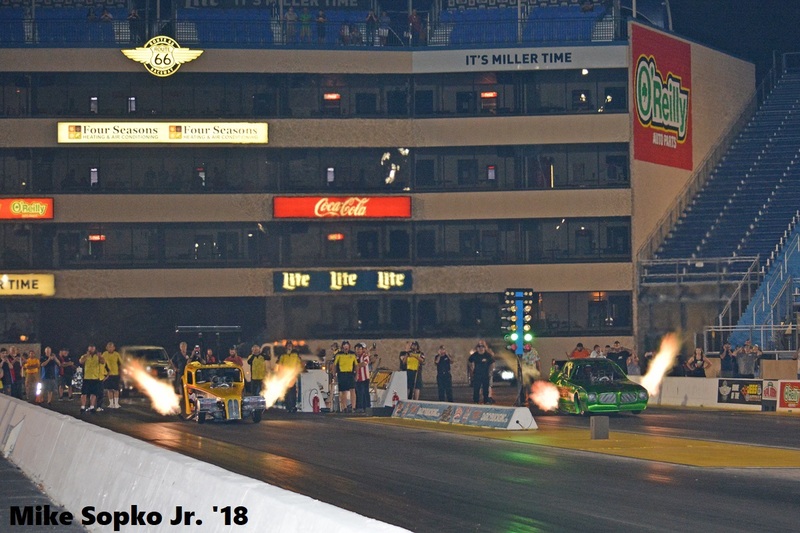 These blown alcohol floppers included Rocky Ausec’s “Solid Rock Mustang,” Ron Oom’s in the “Streaker’s Ride” Camaro, Mark Horvath in the “Mopar Missile” Challenger, and Chris Schneider driving John Troxel’s recently acquired “Brutus” Mustang. 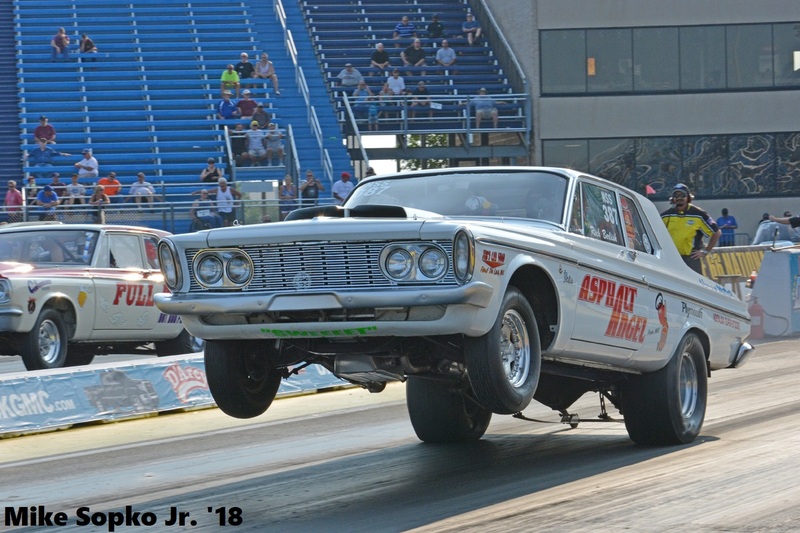 The final posed Schneider in “Brutus” against Horvath’s “Mopar Missile.” Horvath took the win and drove around the Mustang with a 7.10 to Schneider’s 7.54. Mark Horvath in his Challenger on his way to a 7.10 victory! 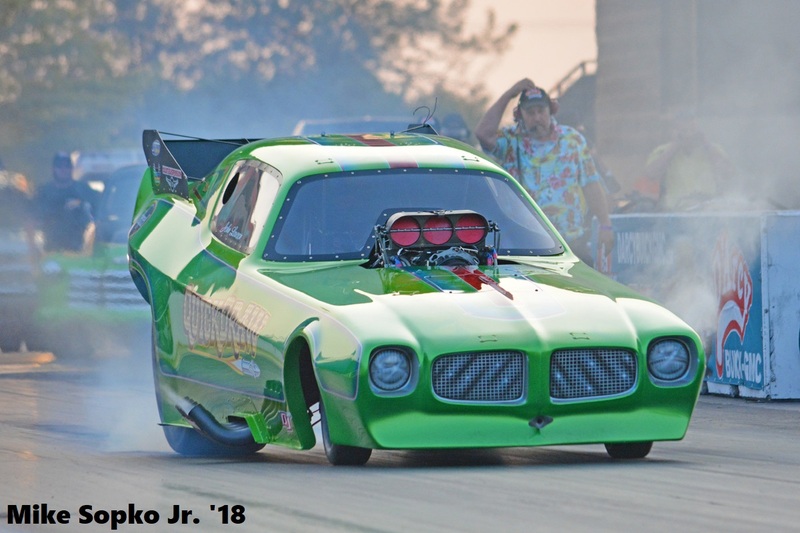 After suffering a spectacular crash during a burnout at the Northern Nationals only a week ago, John Lawson returned to the driver’s seat in his team car the “Quickdraw” Firebird. 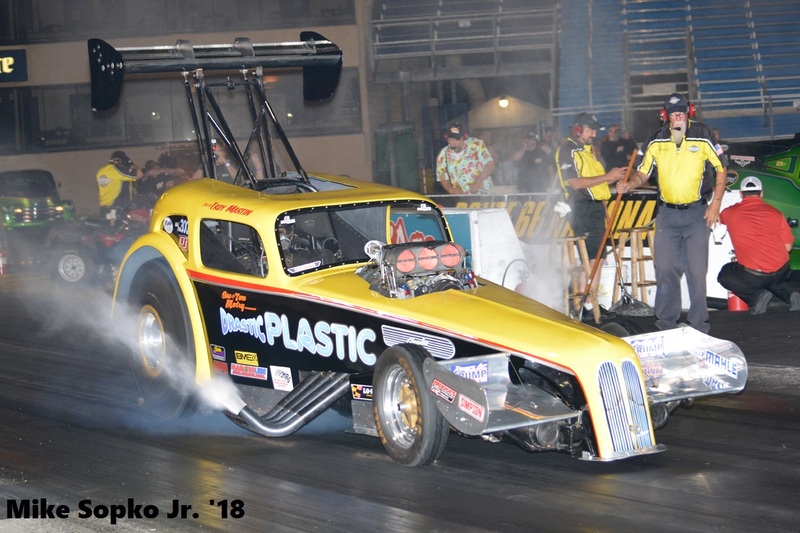 He would match up against familiar foe, Tom Motry’s “Drastic Plastic” with Troy Martin at the wheel. The two went head to head twice on the evening and put on a spectacular flame throwing show with their large pump set ups. The teams split the head to head match up, with Lawson taking the first and Martin taking the second. The first race though not spectacular in terms of numbers was still exciting to watch as it was a pedalfest throughout the run. In looking back at the photos it was clear Lawson was experiencing some severe tire shake as the tire chatter dotted his lane. Martin therefore had the early lead but was also forced to pedal. Lawson did not give up and got back on the throttle taking the win with a 7.07 at 174 mph to Martin’s slowing 7.46 at 119 mph. 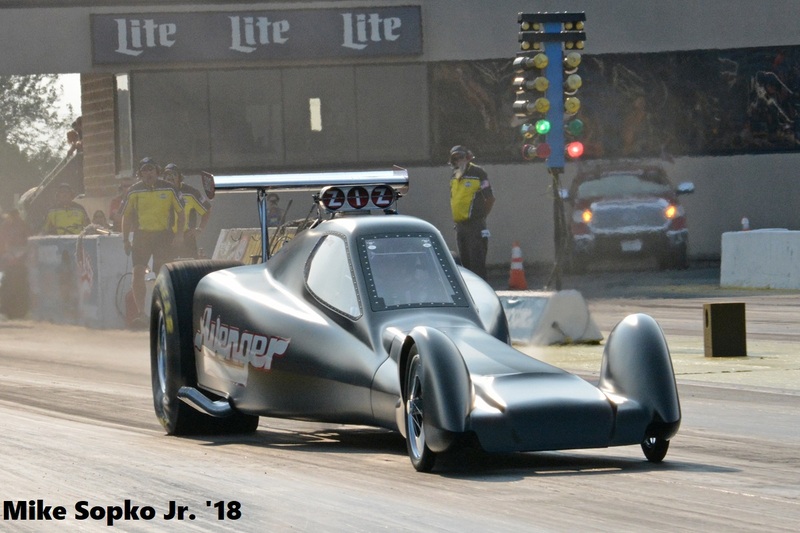 The final was much better for Martin as his car dipped into the 5’s with a 5.91 at 246 taking the win when Lawson got close to the centerline and had to lift. Troy Martin burnsout prior to his 5.91 pass in the last session. 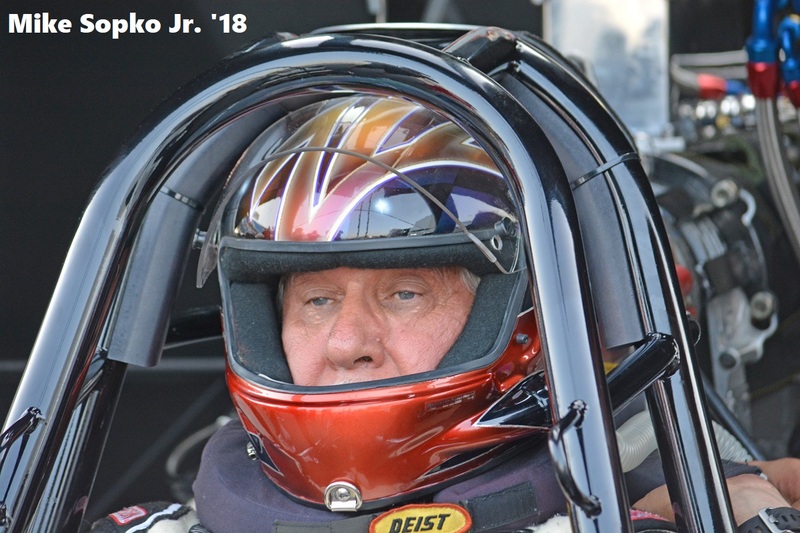 John Lawson returned to the wheel of a funny car after a scary incident at last week's Northern Nationals. If you couldn’t make it this year, make sure to mark your calendars for next year’s event in mid-August.